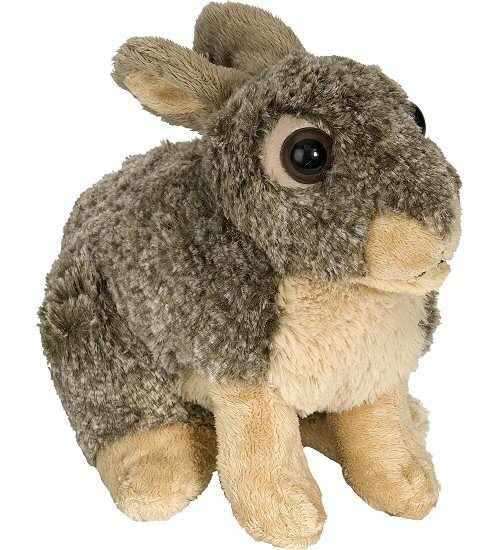 This sweet Cuddlekins stuffed cottontail rabbit is super soft with its brown variegated fur (giving it a gray-brown look) and tan accents on a huggable body. Ready for hours of imaginative fun, this floppy-eared plush bunny was designed with nature and education in mind and has its ears tucked back and a signature cottontail rabbit tail. A portion of the proceeds from the sale of this adorable Cuddlekins stuffed cottontail bunny helps to provide housing and education for disadvantaged children, as well as protection for abandoned animals throughout the world. Fun Facts about Cottontail Rabbits: Did you know that there are at least 16 sub-species of cottontail rabbits? The smallest is the Brush rabbit and the largest is the Swamp rabbit.